We're focused on empowering young children by expanding their vocabulary, scientific knowledge, and reading skills through games and technology. The team is halfway through our production crunch between Half-Semester Presentations and Soft-Openings. 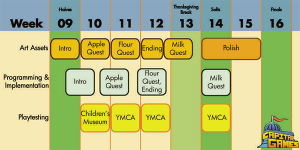 Work on “Food Quest” is continuing along at a steady pace; however, there are pressures on certain areas. 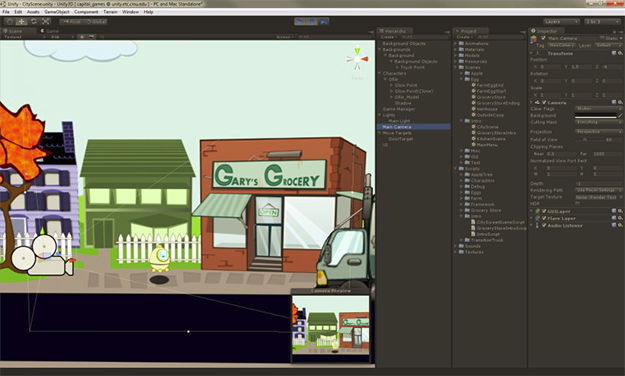 Programmers are finishing the implementation of the Apple Slice in preparation for the playtest this coming Monday. The team has met and discussed the Flour Slice as planned, and the minigame for it has been designed. The script and the art are being worked on, and will be done at the beginning of next week. Production pressures are coming in from many directions: Artists are now struggling to balance polishing assets from all previous slices in addition to creating new ones. 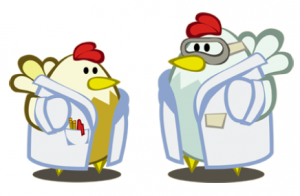 Moreover, the nature of the new Flour Slice requires many new assets – it is not just on farm like the Apple and Egg Slices, but must contain a new secondary location, the factory; furthermore, the factory requires a new character, Tina the Technician. Programmers’ time scales are also being compressed as big playtests are all coming up next week. While we’re behind, the team has a hit a stride in terms of investment in the project and realizing what needs to be done. 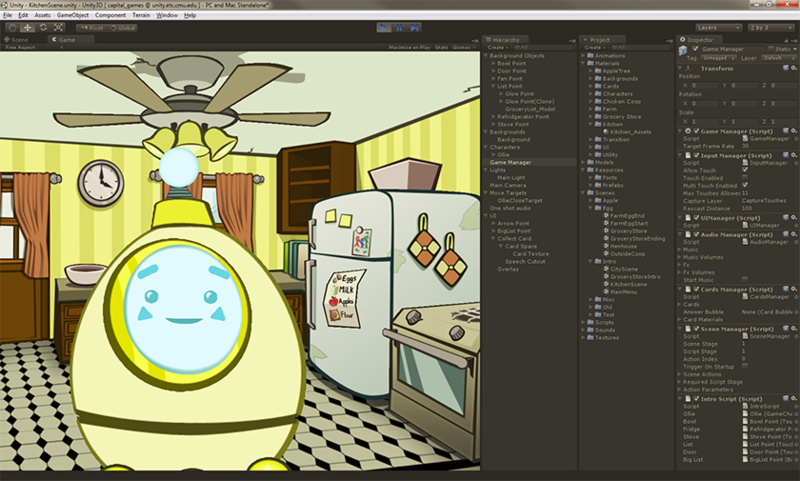 It will be a rough week and a half up to Thanksgiving, and we’re working hard to finish our “rough draft” of the game. In other exciting news, Susan’s team has gotten the iPad build for prototype 3 working. Prototype 3 contains the completed Intro and Egg Slice. Their team has successfully playtested the game with 5 kids, and have returned with useful results. They’ve confirmed the need for instructions that appear if a player does not understand the game or interaction, as well as the need for characters to be able to repeat prompts if the child misses them. Moreover, Susan’s team has provided valuable feedback about useful things to tackle when the team polishes the game: There are certain “missed opportunities” in the current script for teaching moments; moreover, wrong answers to questions, while they should be encouraging, should be less confirmatory and more corrective. Finally, they have also sent us sample vocabulary words that could be more challenging for the kids. We are very excited about the expertise that the team at the Univesity of Michigan is bringing to complement our team at the ETC. After softs, the team will begin to tackle some of these changes while we polish our final product. The assets for our Flour Slice and Ending will need to be done and implemented by Friday next week. 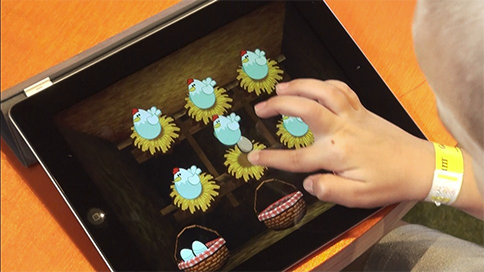 We will playtest the Apple Slice on Monday with the preschool program in Braddock, PA that we had spoken to last week. 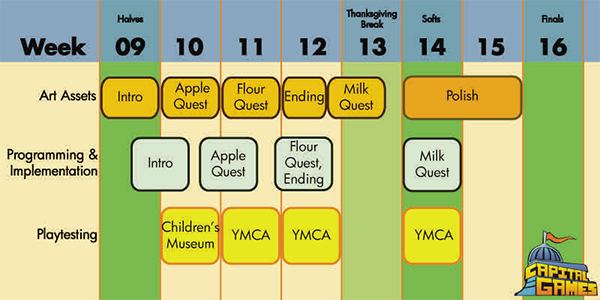 We’ll also be playtesting the Flour Slice and Ending that Friday with the YMCA in the Hazelwood district of Pittsburgh. We are very excited to be where we are, if concerned about our delays and the long road ahead. We’re thrilled to be working with Susan’s team more closely, to have added them as an important part of our development process, and to see that they think we’re moving in a good direction. Happy Halloween to all! Luckily, the specter that was Hurricane Sandy did little to disrupt our operations here in Pittsburgh. We’ve now finished all of our assets for the Introduction and Egg slice, including a major script rewrite to use more challenging words in context. We should be done implementing those in a build by later tonight. We’ve begun work on our Apple slice, including a script, new art assets, an apple collection minigame, and another round of recording sessions with our voice actors. Next week, we’ll begin combining them all together to form the next chapter of our game. On Wednesday, we had our 4th playtest at the Children’s Museum. 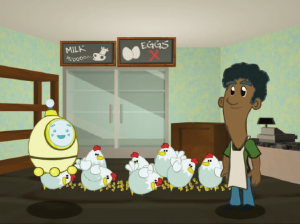 Unfortunately, because our new Egg experience wasn’t yet fully implemented, we concentrated more on making sure the Introduction provided a good starting point for kids in terms of both the narrative and the mechanics of our game. As it was Halloween, we did have the good fortune of lots of playtesters available, as many schools were there for field trips. We were in a new situation where we had to almost fend potential testers off, which is a great problem to have. Nonetheless, we’re now looking at a game that might take up to 8 minutes to complete, so we’ve realized we’re starting to outgrow the Children’s Museum as a playtesting venue for our complete game – it is an environment with a lot of distractions, and moreover, it’s becoming more of an imposition to ask for the time of children (and usually their parents). Albert and Anthony had a meeting with a preschool program in Braddock, PA. They have 4 classes of preschoolers totaling over 60, and seem to be very excited to host us for playtesting. We’re similarly excited to find such a large pool of naïve guests in our target demographic to carry us through the end of the semester. We do realize that we’ve reached a limit, however – while we’re able to effectively test our game for fun and engagement (the “game” side of “educational game”), we’re hoping that Susan and her team can complement us by looking at the educational side of things, where educating kids is their expertise. There have been some technical hiccups in sharing iterations of our game between teams, but we hope to iron that out soon, while also sharing PC builds, so that Susan’s team can get a good look at our content regardless of platform. Next week is the implementation of our Apple assets, and the team switches back into pre-production and production on our next bit of content – flour! We aim to have all of our assets completed for Flour by the end of next week, as test both our Apple and Flour slices in two playtests the week of November 12. On Wednesday, the team gave our Half-Semester Presentation at the ETC. This was our chance to let the greater community of ETC faculty, students, and even guests know what we are doing. We received many thoughtful questions about our designs and mechanics, and were happy to clarify the research that we had done to reach this point. Most importantly though, we laid out our roadmap for the rest of the semester, and are looking to push forward with the project. Our game now has a working title: “Food Quest” – While there were many fun things that we could have done with our title, we believe that short and simple without complex wordplay is the way to go. One of our programmers, Cintia, has already begun prototyping an apple-collecting mini-game for the next section of Food Quest. We are testing the idea of having a timing-based game where the kids must drop apples from a tree into a moving basket below. The artists have essentially completed all the new backgrounds, items, and character animations for our introduction. Moreover, our sound designer has recorded all new dialogue for our introduction and egg slice, except for the farmer character. These assets are ready for implementation, and we hope to see that next week. Next week will be very important in terms of settling back into production mode for the last half of the semester. 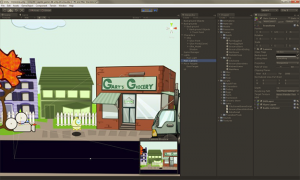 The programmers will be building and implementing the introduction of our game, as well as polishing the apple mini-game. The team will solidify the direction of the apple-finding portion of the game, and the artists will need to complete the assets for this section of our game by the end of next week as well. The team will also be conducting a quick playtest of the implemented introduction combined with the egg-finding quest on Wednesday at the Pittsburgh Children’s Museum. In addition, a few of us will be meeting with the 4kids Early Learning Center in Braddock, PA to discuss playtesting with them in the future. 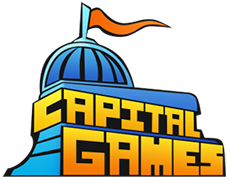 All-in-all, there’s a lot of work to do so expect Capital Games to make some “capital” gains in the near future. responded to our prototype, and how these kids might be similar or different than the higher-SES kids we’d tested with at the Children’s Museum. In terms of their interaction with the game, the words of ETC faculty member Jesse Schell held true: “kids are kids.” That’s not to say we didn’t notice differences, but they were subtle or not related to their interactions with our game. Most of the kids were at least familiar with iOS devices, as many of their parents or siblings had iPhones, while a very small number had seen or used an iPad before. But even in the case of those kids with no previous experience with a touchscreen, they were flying through our game after a very small adjustment period of less than a minute. There was one child that was reluctant to even touch the screen, but loved it once we encouraged him to go ahead. And there were a few kids who would press down so hard while dragging that they would actually drag the iPad around on the table. However, the more significant differences were outside of game interaction. These kids did not have their parents with them, though there was a YMCA staff member in the room with us. The kids were much more shy than we had observed at the Museum, so it was a little harder for us to carry on a conversation with them before or after their play sessions. We also noticed that these kids were much more engaged with the game – we had made only slight changes in the game since our Museum playtest last week, but this change may have been environmental. We were in a fairly boring room when compared to the bustle of the Children’s Museum. Next week is our Halves Presentation – basically, our “midterm” as we present our project is to ETC guests, faculty, and fellow students. It’s also a great for opportunity for us to receive some feedback from our mentors and peers as we go into the last half of our semester-long project. Where we’re not preparing for that presentation, we’re moving forward to make our final edits to the introduction and egg portions of our game. Now that we have a solid idea of who we’re making this for and how they use it, we’re making sure to consciously insert more advanced vocabulary, a shorter time between player interactions, and also making sure that our story is easily understandable and fun! On Monday, October 14, the team went to the Thelma Lovette YMCA for our third playtest. This was an important change of location from the Children’s Museum because now we would indeed be teaching with low-income kids, the project’s target demographic. While we had suspected that they would not behave too much different from kids at the Children’s Museum, we had never done a test to back that up. The game that we tested was essentially the same version that was tested on Friday, October 12 for Playtest #2 at the Children’s Museum. There were some minor tweaks to certain interactive elements to make them use glow instead of the sparkles that we had been temporarily using at the last playtests, but otherwise, content did not change. The testing was very revealing. The kids, as Susan had warned us about, were indeed much shier and quieter when we spoke with them since their guardians were not around. And while some also would look to see how their companion playtester was doing, mostly, the kids were focused on the game. In fact, arguably just as much as the middle/upper-class kids at the Children’s Museum were. The caretakers at the YMCA even mentioned that this was the most focused they usually ever see the kids. What the team believes this means is that while kids from different socio-economic backgrounds do behave differently in social situations, they seem to be similarly engaged by an interactive experience. This is a good sign for our game and we are extremely optimistic that an iPad game can really be something that works across income-levels. The team met early in the week amongst ourselves and with our faculty advisors to map out the new flow of the game as completely as possible. We also met with Susan’s team on Wednesday to clarify their concerns about the current direction. Most significantly, the game now has a more tangible overarching goal of collecting the ingredients needed to create an apple pie rather than the vague idea of buying groceries. An issue that has arisen is the conflict between game design and education. Game design often assumes that a player knows nothing and explains as much as possible so that the player does not become frustrated and give up; however, a good education must expose concepts that are a bit above and beyond to help encourage critical investigation and growth. Balancing these two may take a lot of fine-tuning in the near future. Ollie, our sidekick, also still needs a satisfactory introduction as well as a clear relationship with our players. The team wants the peculiar little guy to be a mentor for the child that knows what to do but doesn’t necessarily have all the answers itself. Whether or not that is communicated will need to be tested with kids. The second prototype was finished on Friday. 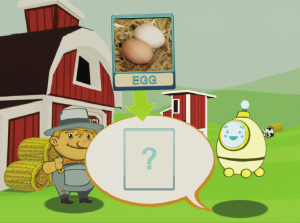 It is only a small chunk of what would merely be the egg “slice” of our game: The prototype starts after the player has first arrived at the farm and continues all the way to when the player finishes answering the grocer’s evaluative question. The new prototype implements many of the aesthetic touches that we realized were essential to engagement, including things like animations, sound effects, pulsing highlights, etc. One of the caveats of this prototype is that it uses scratch dialogue and a temporary script. The design and story have changed a lot since the last playtest, and much needed to be re-written; however, as our writer was at GDC Online, the team had to do some makeshift writing and recording ourselves. 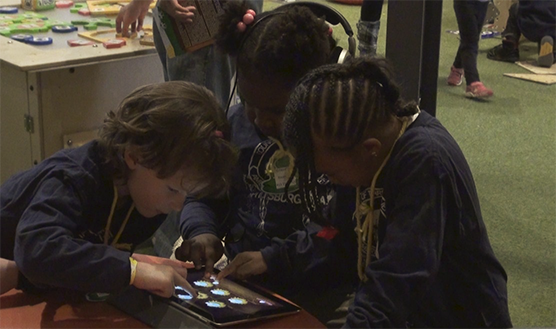 Our second playtest at the Children’s Museum of Pittsburgh, which was scheduled for Wednesday this week had to be pushed back to Friday afternoon due to development difficulties. Unfortunately, the late time also meant that many guests were exhausted and on their way out of the museum. Nonetheless, the team got a couple of people to playtest and found out some very useful things. On the positive side, the highlights and animations have indeed increased engagement and helped cue the children on what to do. Moreover, the expansion of the card mechanic to be a primary interaction with questions and problems within the world was a great success. Without having to provide a tutorial, we found that the kids intuitively discovered to tap and drag the cards into answer spaces. As to the shortcomings of the current iteration: There are still sections of dialogue that are just a little too long for the kids to stay engaged. Moreover, when kids do miss an important cue, the game needs to have a way to remind them either through tapping on Ollie, their helper, or a timeout. Indeed, we noticed that this was one of the things that parents were still doing to help their kids through certain puzzles and is something that we want the game to be able to do itself. The outlook looks good for the basic mechanics. There are just a few more places where the interactive components need to be further distinguished, but otherwise, kids are navigating the interface very smoothly now. Otherwise, the big challenge now is to flesh out the story and the educational portions. As our writer/lead designer is back now from GDC Online at the end of this week, we will be able to make headway on this next week. We’ll be conducting our first playtest with low-income kids at the Thelma Lovette YMCA in Pittsburgh on Monday, and the team is excited about playtesting with our target demographic. Nevertheless, the playtests we’ve conducted so far with middle-income kids are still very useful: By observing kids from different socioeconomic backgrounds, the team can learn even more about the gap between them that we are trying to address. There are a lot of unknowns before us but with these playtests, the team is beginning to decipher them. Friday, October 12 was our second playtest at the Pittsburgh Children’s Museum. We’ve built out a lot more of the egg slice of our game, implementing a lot of what we found the game needed from the last playtest. 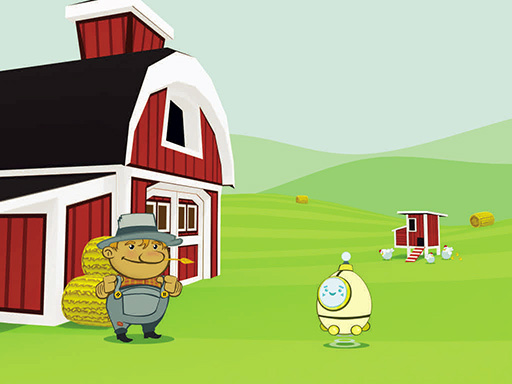 The game now takes the player from when they arrive on the farm to look for eggs up through the knowldge evaluation back at the grocery store. 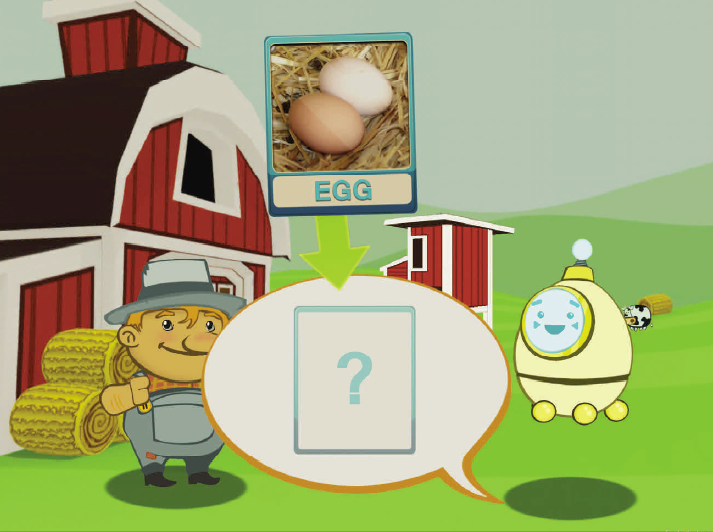 Interactive objects highlight and players can solve puzzles using their visual vocabulary cards as dialogue. There were also portions that were not completely implemented and there were no glows to indicate what the next step was; in some places, the team managed to implement sparkles, other places nothing. Unfortunately, the team arrived at the museum a little late and many families were in the process of leaving so we did not get as many playtests as we would have liked; nonetheless, the results seemed promising. Kids stayed engaged and knew that the highlights showed them what to do next. Surprisingly, sparkles worked less well than highlights. There were also two moments when the temporary dialogue was too long and kids lost a bit of attention. The team feels that this test, however, was great proof that we are heading in the right direction with the changes that we are making. 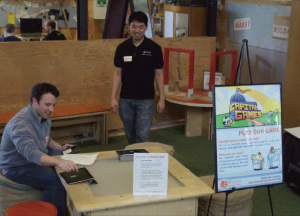 On Monday, Capital Games conducted its first playtest with kids at the Pittsburgh Children’s Museum. Our game had seven testers, aged 3 ½ to 6. This first test was mostly focused on the physical interaction between the player and the iPad. Our team has never worked with children this young, so it was extremely valuable to see how they reacted to our game and what they wanted to do with the device. Going forward, the fact that Capital Games now has this shared experiential vocabulary is making it that much easier to discuss our demographic and design our game with our players in mind. As any first playtest, Monday was humbling as the first reflection on the wide gap between a game designer and its target audience. Player interactivity and agency was low, even when the player knew what was expected to con-tinue the game. In internal conversations and with our advisors, we wondered if we were playing things too safe and if we were building something we are passionate about and can be proud of. As a student project (and a noncommercial product), we’re in a unique position to try to push the envelope. Whether we’re an overwhelming success or we make some mistakes along the way, we can only learn things for ourselves and for this area of educational game design. We know we want to design an experience that can be played without supervision or outside assistance. At the other end of the spectrum, the cognitive abilities of 4 to 6 year olds present a limit to how much we can push. As most of us are game designers and advanced, high-information gamers, we’ve struggled with the fact that most “games” in this space aren’t actual “games” in that they lack true fail-states and tough decisions on the way to a clear, defined win. Most would better fit a “toy” label, with a few of the more advanced experiences including puzzles and elements of games. And while our current iteration has obvious shortcomings, we have realized that we’re different in that we are directed and intentional, and that we’re not just a toy. 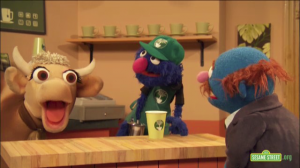 After additional brainstorming, game research, and watching lots of Grover, we’ve come to some exciting conclusions about our future direction. We’re excited about our card mechanic – it’s been a success in many ways: a collectible, a way to give the player a vocabulary, and a way to tie our abstract art style to real world representations. We feel that we’re on a good path, if we make sure to include some additional elements. While we’ve described our game as an adventure game, we’ve left out the most important aspects of adventure games: a zany story and puzzles. Going forward, we’re making sure to give the player more opportunities to interact with the game world, more agency within that world, and a more comedic story. With such a story, we’ve realized that we can reframe our questions as puzzles. 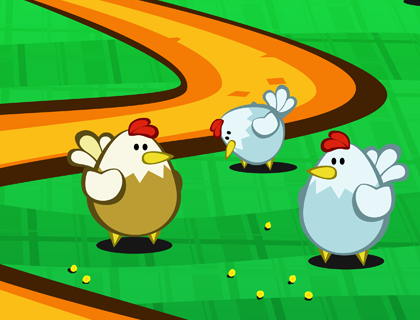 For instance, rather than asking “what do chickens eat?” and awaiting an answer, we can present a hungry chicken as an obstacle or puzzle to overcome to advance in the game. In either case, the player can play a CORN card, but in the latter, the payoff is not just a “you’re correct.” Instead, the payoff is game advancement, and observing the world react to this correct answer. For the coming week we’ll be looking forward to welcoming back Tim and Mike. As they return from their exciting trip to Indiecade we will also be saluting Anthony as he departs for Austin, Texas and the GDC Online convention. As the team returns, we’ll be hitting the ground running to get our next iteration of the prototype on track with our goals. On Wednesday we have an opportunity to be hosted again by the Children’s Museum and a chance to see a more polished product in the hands of youngsters. Until next time, have a Capital Week! 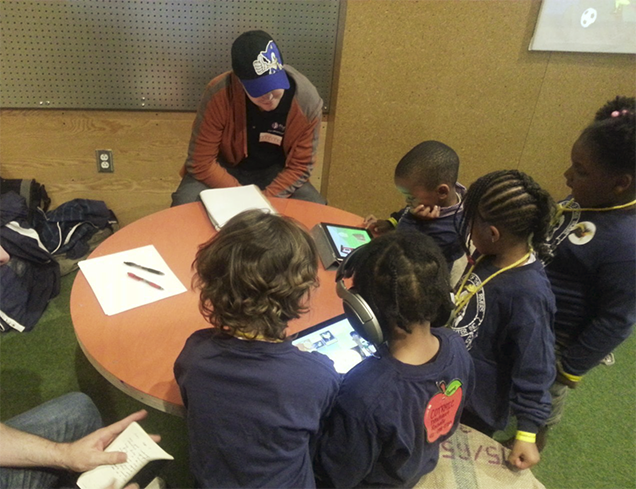 On Monday, we had our first playtest with kids at the Children’s Museum. 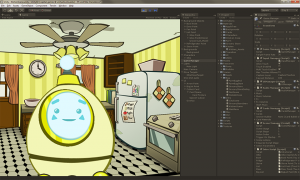 It was a rough build for which we had developed all of our assets in less than 2 weeks, a slice of our intended whole experience that was intended to walk a player through every interaction of exploring the origin of one common grocery item. In this case, eggs. Now, the first few weeks of our project included a good deal of research into how 4-6 year olds interact with our technology. But watching actual kids try to play our actual game (with a fair amount of both failure and success) was informative in a way that any amount of research could never be. As a team, we’d never worked with a demographic so young before, so having this shared experience where we have seen, live, how kids use their hands with an iPad, and how they WANT to interact with this technology, really helps us conceptualize and plan for further iteration. Major takeaways included that we need to do more to direct the player’s attention, include a few more tutorial graphics and spoken words, and build our interactions more solidly around what kids want to do. On Monday, ETC faculty visited the project to hear about our direction and progress. The team received useful feedback in regards to how we could make our game stand out from the many that occupy this market space – including having the game be able to stand on its own without audio as well as focusing on the games before the story. We’ve also been following up with newly-suggested play-testing resources and knowledgeable contacts in this space.